FREE Performance of JCompany's MADAGASCAR JR! You are invited to Madagascar JR. free of charge, on Thursday, March 14 at 7:00 PM. 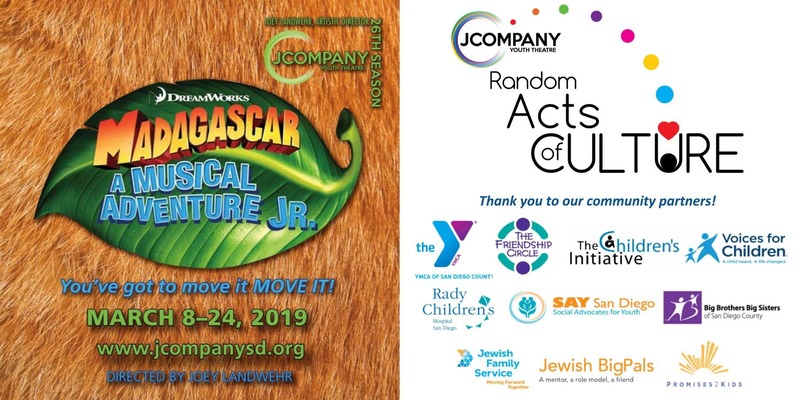 JCompany Youth Theatre is proud to offer “Random Acts of Culture," providing communities all over San Diego with the joy of FREE live youth theatre, thanks to generous corporate sponsors. PLEASE NOTE: To join us, reserve your ticket on Eventbrite ahead of time. Be sure to arrive early to select your seat. Doors open at 6:30pm. Require accessible seating? Want to bring a large group? Email jcompany@lfjcc.org. Want to be included in our newsletter to recieve other free offers? Emailjcompany@lfjcc.org. JCompany Youth Theatre is a nationally recognized, award-winning youth theatre program of the San Diego Center for Jewish Culture at the Lawrence Family Jewish Community Center, JACOBS FAMILY CAMPUS.